Maybe a stupid question, but the servos can remain connected right? While updating. If not mistaken had updated the Rex 12 few months ago, unless there is another update. i don't see why not. unless they are programmable servos. i know it's a real pain to have to take the receivers out just to update them . Yes you can update connected, I do it all the time. I´m trying to setup a twin turbine telemetry setup in my ds-24. It´s the Jetcat adapter. The tx can´t read booth adapter at the same time. Only one of them no matter in what rx I plug it. I tried booth on same rx with a Y harness or in different rx ports as well. No success. Has anyone made this? Not familiar with your device, but you may want to google CTU from Digitech which can do 4 motor on ExBus as well, seen in the device folder....I have been using it with success. As Daniel write, look at the CTU! if im not mistaking, the jetcat can not be set as a master and slave. therefor only using one at a time. the Digitech CTU can be set as a master and up to another 3 slaves , and has multiple EX ports for expansion. we just made the twin LUA for customers , and tested by the little jet company for their SeaDart project with 2 x P-300. I’m jealous this LUA has more data then the single engine version........per engine..
wait until next week , we have a upgrade coming ;-). Running into some problems with the 900 MHz backup Rx. Using a single Rex 12 with 900 backup. Rex 12 is connected to port E1 and selected PPM input and 900 connected to port E2 PPM output. problem is when I select disable all transmission except 900 in the Tx it will switch to backup and 1 elevator servo won’t work. Rest all surfaces work fine on the backup 900. Anyone seen this before or knows what I can try next. Will try this and get back, downloaded the Jeti studio V 1.1.1 and the Rx will not show up on the computer in the device update. Earlier version would show up instantly. Tried it on other Rex Rx as well, same problem on a Mac and PC. Did that LA guy, same problem. Anything else you can think of. Download firmware 1.12 manually here. 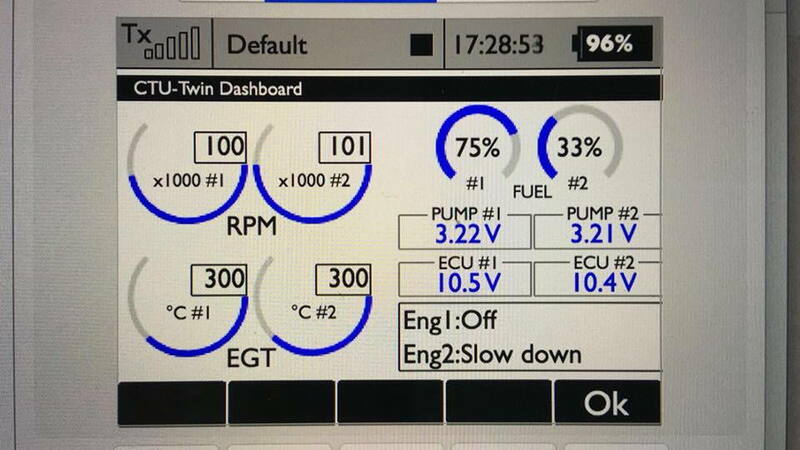 Firmware Update: Receivers, controllers, sensors, Tx Modules: JETI model s. r. o.
I may know the problem. Go to Device Explorer => RSat900 => General Settings and increase the number of channels. Thanks a ton LA jet guy. All works fine now. Hopefully I can test fly my Rebel hot this weekend. I am a new DS24 owner and am struggling to get it set up as I am spoiled with the ever user friendly Futaba radios which I have been using for a very very long time. I bought this DS24 (arrived last week) mainly because of the dual frequency transmission signal feature which gives an extra bit of safety when I start my new hobby in turbine jets as I am flying gas giant planes for a long time now & have decided to try the 3d turbine jets. So back to my problem with the DS24. Mix 3 - Rudder1 to Rudder2 to Rudder3. I have no problem creating these mixes in my Futaba radios as the options to select are plentiful. I wonder why the DS24 has only the limited basic functions like Ailerons, Elevator, Rudder, Throttle, Butterfly to select from. Am I missing something in order to get more options to select and if addtional options can be created, I thank you in advance to disclose the setting to me. You should look into free mixes menu. Don´t you worry that your Ds-24 can make anything that your Futaba radios can. If you need something on your TX that a Ds-24 can´t make probably your plane is too complicated to fly and will not be a good flyer.